Photo: International Rivers. Creative Commons BY-NC-SA (cropped). What are the implications of climate change for economic growth and development? What benefits are obtained from mitigation policies? What are the costs of pursuing mitigation policies? These questions are particularly pertinent for developing economies due to the higher temperatures generally prevailing in these countries, a higher level of climate sensitivity, and more limited adaptation capacity. In order to answer the first two of these questions, we need to understand the effects climate change will have on a given country’s economy, and the effects various climate change policies will have on the ultimate outcome. UNU-WIDER, as part of its Development Under Climate Change (DUCC) project, developed a framework which seeks to shed light on these questions. The answer to the third question depends on the kinds of mitigation policies pursued. One possibility, regional or even pan-African low-carbon energy strategies rooted in hydropower, is the focus of a new project from UNU-WIDER. The change in climate manifests itself as a change in expected levels for temperature, precipitation, barometric pressure, humidity, and other weather outcomes. However, with this information alone, it is difficult to assess the potential impacts of climate change on many variables of interest for human societies — such as economic growth, development prospects, and the material well-being of the population. 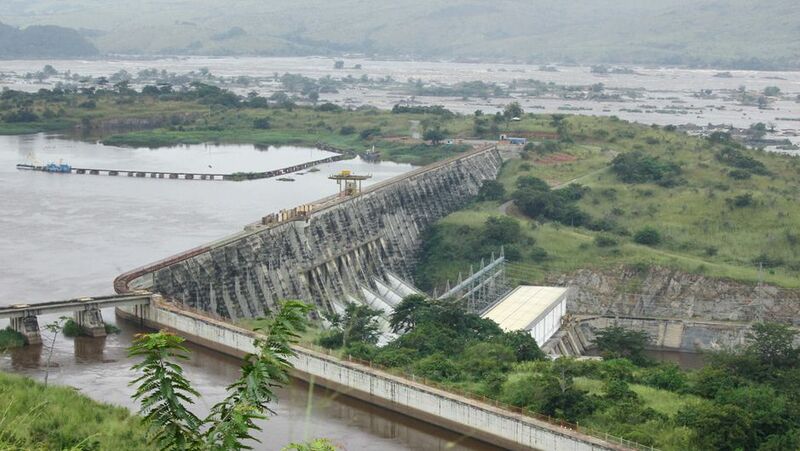 The framework developed in the DUCC project traces the implications of changes in climate outcomes through a series of important impact channels — including production of hydropower, agricultural yield, water supply/demand balance, and costs of maintaining infrastructure and other installed capital. These impacts then serve as inputs into an economy-wide model of the country in question. The economy-wide models employed respect macroeconomic identities, meaning that all futures are economically coherent, and account for multiple simultaneous impacts. For example, higher levels of rainfall may be favourable for hydropower generation and agricultural production but unfavourable for road infrastructure due to washouts or widespread flooding. One of the unique aspects of the framework is explicit treatment of the considerable uncertainties associated with projections of climate change at the country, regional, and global levels. For example, future temperature levels are not known exactly due to both uncertainties in climate sensitivity for given concentrations of greenhouse gases and uncertainties in the future quantities of greenhouse gases that will be emitted. The framework relies upon multiple global change projections derived from the Integrated Global Systems Model developed and maintained at the Joint Program for the Science and Policy of Global Change at MIT. For each future climate that enters the system, a corresponding future series of biophysical and economic outcomes is generated. This system allows for consideration of the range of possible outcomes as well as the most likely set of possible outcomes. This is useful for policy makers. There is a difference between the assertion that a reduction in the size of the economy by about 10 per cent in 2050 is possible versus the assertion that the outcome is likely. 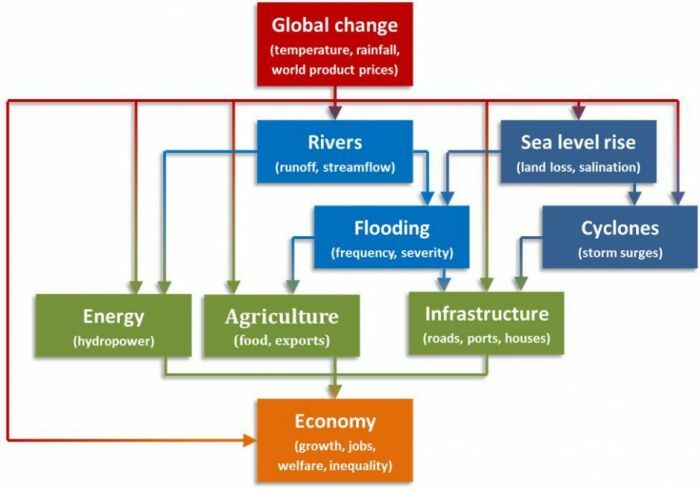 Figure 1: Systematic Analysis for Climate Resilient Development (SACRED) framework. The graph below represents the results of the framework as applied to the case of Mozambique. The focus here is on economic growth to 2050. The green line in the graph indicates that the large majority of climate scenarios result in economic losses when no global mitigation policies are pursued. While GDP losses typically range from zero to about five per cent, a few climate scenarios are associated with economic losses of 10 percent or more — eg., losses of greater than 10 percent by 2050 are possible but not likely. 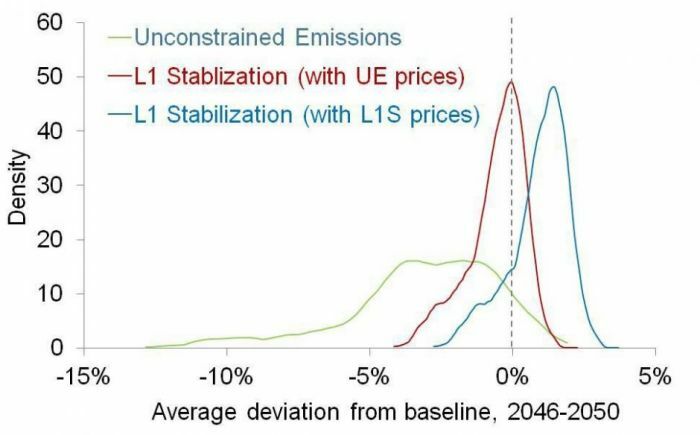 However, under a stringent emissions reductions scheme (Level 1 stabilization, the red line), losses are considerably reduced and the long negative tail is eliminated due to more favourable climate outcomes. Changes in commodity prices, especially lower oil prices, are associated with strong and effective global mitigation policies. The blue line illustrates the economic gains realized by Mozambique when such policies are pursued. Figure 2: Mozambique — GDP level relative to a no climate change baseline in about 2050. These results indicate that there would be substantial benefits to climate change mitigation policies in Mozambique, relative to unconstrained emissions. This is the case even in the relatively near term on climate timescales. As climate change impacts can be expected to be much more severe in the latter half of the twenty-first century, the future benefit stream from mitigation policies to these countries can be expected to be much larger. Similar results are found for Zambia and Malawi. It is important to highlight that in the example above Mozambique does not impose mitigation policies of its own. Hence, Mozambique benefits from more favourable and more predictable climate outcomes and from the terms of trade gain associated (principally) with lower oil prices while avoiding the costs of energy transformation. As such, the unconstrained emissions and Level 1 Stabilization results do provide worst and best case scenarios from the Mozambican perspective. Eventually, effective mitigation will require the participation of all countries. The results indicate that there is space for Mozambique to engage in mitigation policies, particularly if low-cost options can be identified, while maintaining a development path well superior to a world with unconstrained emissions. While the goal of effective global mitigation is clear, the question of how to achieve it remains. As hinted above, mathematics dictates that both developed and developing countries must play a part in reducing global emissions (UNU-WIDER 2014). The obvious place to begin, in both developed and developing countries, is with options that result in substantial emissions reductions at low cost. To this end, UNU-WIDER has been analysing a transition towards lower-carbon electricity generation with an emphasis on hydropower, and a focus on the African continent. The Congo River, in particular, represents an enormous source of power with very low emissions. As the largest producer and consumer of electricity on the continent by a large margin, South Africa would play a key role in any decision to pursue a regional energy strategy, anchored in hydropower. Such a strategy might eventually lead to the construction of a pan-African electricity grid. UNU-WIDER has teamed with personnel from the Energy Research Centre at the University of Cape Town and the Economic Policy Division of the National Treasury to consider regional energy options. We find that importing hydropower from the region is roughly cost-competitive with continued exploitation of South African coal reserves. The regional option preserves or enhances economic growth rates in South Africa while displacing nearly 1.9 billion tonnes of CO2 emissions relative to a business-as-usual path by 2040. Even at very conservative estimations for the value of emissions avoided, the net present value amounts to nearly US$21 billion. (The value of carbon emissions avoided increases linearly from US$3 per tonne in 2015 to US$30 per tonne in 2024 and then remains at that level through 2040, which is the terminal year for the analysis. The discount rate on the NPV calculation is five per cent. ) And these values are underestimates, in the sense that South Africa would not use all hydropower produced under a regional energy strategy. Other countries would also benefit from the power produced. Pursuit of a regional energy strategy also has the benefit of fomenting greater regional integration. Furthermore existing studies indicate that hydropower facilities can functionally serve as batteries and help to substantially increase the useable output of other renewable energy sources (wind and solar). Research into integrated renewable energy production systems which could function considerably better together, than each system would on its own, is an ongoing area of future research. To be sure, the pursuit of a regional energy strategy, anchored in hydropower production, is far less straightforward than mining known fossil fuel reserves and burning them to produce electricity. In the absence of any environmental considerations, the balance of benefits and costs, including risks such as political risk, would tilt towards continued exploitation of fossil fuels. However, environmental considerations do exist, both at the local and the global level as exploitation of hydropower potential comes with local environmental costs. A regional or even pan-African energy strategy potentially represents both a step towards achieving the desired state of the world in terms of long-run climate stability and providing low-cost energy to fuel African development. Careful analysis of these sorts of options represents a best first step forward. This article originally appeared in the WIDERAngle newsletter, February 2015, ISSN 1238-9544. Creative Commons Attribution-NonCommercial-ShareAlike 3.0 IGO License.